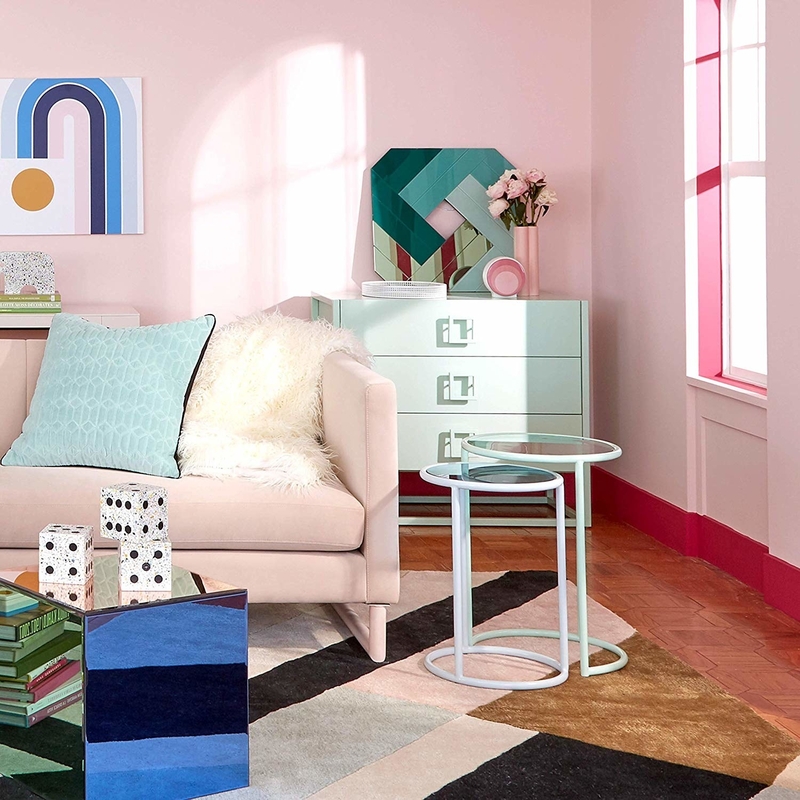 Decor this darling will help make your living room a place you actually want to live in. 1. A velvet sleeper sofa with an incredibly comfortable queen-sized mattress and a stunning velvet style, for anyone who wants their guests to dream about life in a living room as lovely as yours. I constantly have guests staying at my apartment and I needed a sleeper sofa that wouldn't take up much space, while still being comfortable enough for two people to sleep on for extended periods of time (because when our parents visit, my husband and I are the ones on the sofa). I ordered this sofa in a customized color/fabric and I couldn't be happier! It's comfortable, gorgeous, and the queen-sized mattress is almost more comfortable than my bed. Seriously. Get it from Joybird for $2599 (available to customize). 2. A magnetic light so you have a dramatic piece of decor that's sure to ~attract~ everyone to it. Get it from Amazon for $42.95+ (available in three colors). 3. A pint-sized moon shelf that'll make people all kinds of starry-eyed over your living room desk set-up. Get it from Indoor Survival Co. on Etsy for $39.99. 4. 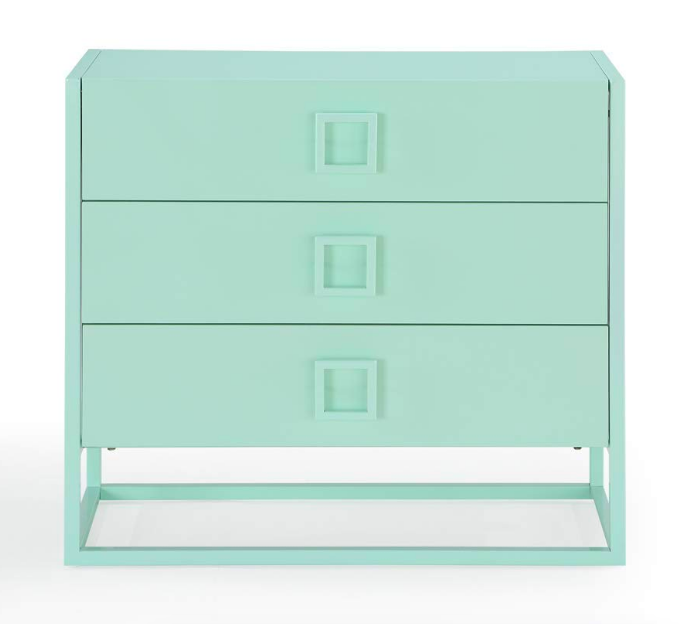 A mint dresser sure to look as sweet as candy in your space. Get it from Amazon for $488 (available in two colors). 5. A glass bird, because sometimes an artistic knick knack is the perfect thing for helping your decor take flight. Get it from West Elm for $19 (available in three styles). 6. A set of three floating bookshelves — they're gonna add a little magic to your somewhat dreary white walls, while saving your minimal floor space from bulky bookshelves. Get them from Amazon for $26.15 (available in three set sizes). 7. A sticker clock as a unique statement piece you'll want to ~stick~ with forever. Get it from Good Thing for $10 (available in seven colors). 8. A coffee table book that just might be the picture perfect way (literally) to add a little something to your little coffee table. 9. A traditional blue rug sure to set a cool tone for your entire apartment. Get it from Amazon for $68.28+ (available in two colors and 19 sizes). 10. A circular wall mirror that might not be the angle you were originally looking for, but you'll always be glad to have it around. Get it from Amazon for $99.99+ (available in three sizes). 11. A droplet vase so pretty, a flower would almost take away from it (which is great news for anyone who knows plants don't live long in their living room). 12. An out-of-this-world sconce light that'll definitely make your decor take off. 13. A crystal candle for a sparkly-yet-dark aesthetic that'll really ~rock~. Get it from Free People for $58 (available in three colors). 14. A pair of throw pillows you can simply throw down on your couch to add a sophisticated touch to your living room. 15. A trinket dish or trinket box that'll help keep small messes from building up on your living room surfaces. Honestly, ~eye~ can't believe this isn't in your cart already! Get the dish for $20 and the box for $30, both from Amazon. 16. A stunning modern futon for giving your mid century home an elegant twist. Get it from Amazon for $255.99. 17. A set of personalized scrabble tiles so you can up your wall decor ~game~. Get them from Signs of Zest on Etsy for $3.50/piece. 18. A weathered oak desk set for keeping up a minimalist living room, even if it's also your office. Get it from Amazon for $49+ (available in four styles). 19. A pouf pillow that'll make the extra seating in your space extra stunning. Get it from West Elm for $159. 20. A rattan bookshelf to give your most beloved books a storage space as gorgeous as their stories. Get it from Urban Outfitters for $399. 21. A polka dot pot that'll fit in any ~spot~ in the room. 22. A chrome accent table — it's sure to make your living room shine. Get it from Amazon for $188 (available in two colors). 23. A darling wire pup sculpture that'll lift you up when life feels like the ~pits~. Get it from Wire Accents for $17+ (available in three colors). 24. A contemporary accent chair you can keep in the corner just in case Don Draper ever invites himself over. Get it from Amazon for $86.99+ (available in two colors). 25. A hanging hook so cute and clever you're gonna want to give it a hand. Get it from Urban Outfitters for $14 or get a similar version from Amazon for $29.99. 26. A gorgeous woven throw blanket to keep your couch cozy, cute, and comfortable. Get it from Amazon for $79.99 or grab a less expensive throw for $14.81. 27. And, finally, a lucky horseshoe wall hanging you're gonna want to ~filly~ your walls up with fast. Get it from Free People for $56 (available in three colors). When you finally turn that house into a home. Check out the posts below for even more inspiring home decor for every sense of style.